ST. LOUIS - The St. Louis Rams took a big step forward this season, going from six wins total the previous three seasons to a 7-9 record with an opportunity to win the NFC West in their final regular-season game. The big question now is what comes next for Steve Spagnuolo's squad? The Rams have plenty to build on with a strong nucleus that includes quarterback Sam Bradford, running back Steven Jackson, middle linebacker James Laurinaitis and defensive end Chris Long. St. Louis has already made some moves in preparation for the 2011 season, with offensive coordinator Pat Shurmur leaving to become the head coach of the Cleveland Browns and the Rams hiring former Denver Broncos coach Josh McDaniels as the new offensive coordinator. Questions abound about how much influence McDaniels, the former Patriots offensive coordinator, will have on the Rams' offense, how much Spagnuolo will allow McDaniels to do his thing and how much different the offense will look next season. When Spagnuolo met the media to talk about McDaniels' hiring, he made it sound like not too much would change. "I think there's going to be a natural mesh here," he said. "Keep the things you really like and what you've been doing well and everybody's comfortable with, you add a little bit of something else, and I think it's always great to have a little bit of zip and juice or something new." When he spoke with reporters on a conference call a few hours later, McDaniels echoed what Spagnuolo had said earlier. "There's plenty of things that the St. Louis Rams have run last year that we're certainly going to repeat again, and there's plenty of things that we'll probably study this offseason and think that are good ideas that we'll take a look at," he said. "I think you do that every year, and I think that players are really pretty tough in terms of learning. They can figure out what you want them to figure out, and you find ways to do that as coaches. I think it'll be exciting to ultimately figure out now what we're going to make this offense look like in St. Louis." There is a lot for McDaniels to work with, starting with the quarterback and running back. Bradford is coming off one of the best rookie seasons by a quarterback in NFL history. The No. 1 overall pick completed 60 percent of his passes (354 of 590) for 3,512 yards, with 18 touchdowns and 15 interceptions and a quarterback rating of 76.5. The University of Oklahoma product broke the rookie records for attempts and completions and finished second for most passing yards by a rookie in NFL history. Bradford was third in the NFL in attempts, seventh in completions, 12th in passing yards, 18th in touchdowns, 20th in completion percentage and 25th in quarterback rating. "I felt like I improved," he said. "I felt like the coaches trusted me more at the end of the year. I felt like they put a lot more on my plate, which is something I take a lot of pride in, the fact I was able to progress in this offense and able to handle more, probably more than I would have expected. Hopefully that continues." The 27-year-old Jackson was selected for the Pro Bowl for the third time in his seven-year career and finished with 1,241 yards rushing and six touchdowns on 330 carries, an average of 3.8 yards per carry. He also caught 46 passes for 383 receiving yards. Jackson became the Rams' all-time leading rusher, passing Eric Dickerson, and then became the 12th player in NFL history to rush for more than 1,000 yards in six consecutive seasons. The Rams' offense showed marked improvement from the 2009 season, when they were one of the worst in the league on their way to a 1-15 record. In 2010, with a rookie quarterback and an unproven group of wide receivers, St. Louis was 26th in the NFL in points per game (18.1) and yards per game (302.9). The Rams were 21st in passing yards per game (204.2) and 25th in rushing yards per game (98.6). The biggest questions surrounding the offense going into the 2011 season are concerning the receiving corps that lost Donnie Avery and Mark Clayton to early season-ending injuries and how the team can add more playmakers for Bradford to work with. Several early mock drafts predict that the Rams will select University of Alabama wide receiver Julio Jones with their first-round pick, No. 14 overall, this spring. St. Louis' offensive line, which featured youngsters Rodger Saffold and Jason Smith as the bookend tackles, figures to be improved next season but could use a boost with the addition of another guard through free agency or the draft. The Rams' defense, led by youngsters like Laurinaitis and Long, made an even bigger improvement from the 2009 season to 2010. The Rams finished 2010 ranked 12th in the NFL in points allowed (20.5 points per game), 19th in yards allowed (336.8 per game) and passing yards allowed (223.6), and 17th in rushing yards allowed (113.1). St. Louis was seventh in the league in sacks (43) and 19th in interceptions (14) after ranking 30th (25 sacks) and 31st (eight), respectively, in both categories the year before. There are questions on the defensive side of the ball going into next season. What impact defensive players can Spagnuolo and the Rams bring in? Will they address the need for outside linebackers through the draft or free agency? Will veteran James Hall, who had a team-high 10.5 sacks in 2010, return and make a similar impact in 2011? It should be a fun offseason in St. Louis. When Spagnuolo and his players met with the media the day after their season-ending loss to Seattle, each spoke about being excited for the future of the Rams going forward. "I do believe we have a lot to build on here," Spagnuolo said. "I firmly believe that. I know the players do. People in this building do. There was a lot of good that came out of this season. It's hard to think about that right now, because we're all still a little scarred from yesterday, but I think as time goes on here we'll all realize that we did some good things. I believe this experience that we went through yesterday will make this football team hungry, because when you get right there and you get a little bit of a taste of it, that only just makes you hunger for that particular feeling going forward." Laurinaitis, who had just wrapped up his second pro season, was eager to start his third NFL season as soon as possible. "I'm excited about what's ahead for this franchise," he said. MVP, offense: Sam Bradford. Nothing against Steven Jackson, but it's obvious that no player elevated the franchise more in 2010 than Bradford. MVP, defense: Middle linebacker James Laurinaitis. Not many MLBs in this league can stop the run and cover downfield the way Laurinaitis does for the Rams. And he's the brains of the defense. Rookie of the year: Bradford — but a special mention to left offensive tackle Rodger Saffold. Most disappointing rookie: wide receiver Mardy Gilyard. Best coach: head coach Steve Spagnuolo. His leadership was, for the most part, outstanding. The Rams handled adversity pretty well and Spags was a positive factor in this. The coach made the right call to go with Bradford as the immediate starter and in playing a role in fast-forwarding Bradford's development. Spags really shined in getting his defensive system installed and teaching the players to thrive in it. The Rams went from 31st in the league in points allowed in 2009 to 12th in points allowed this season. They went from 29th in allowing third-down conversions to No. 2 in stopping third downs. They were 31st in passer rating against last season and No. 9 this season. The Rams went from 28th in sacks per passing attempt to No. 8 in sacks per passing attempt. And they were dramatically improved in the red zone. The rushing touchdowns against them dropped from 24 to seven. Worst coaching: The Rams' running game underachieved. The design wasn't creative. It was predictable. The Rams made it easy for the defense to stop. This is a shared responsibility. The head coach, offensive coordinator Pat Shurmur, offensive line coach Steve Loney. Best leader: Tough call, but we'll go with Jackson on offense and safety Oshiomogho Atogwe on defense. Best free agent pickup: defensive tackle Fred Robbins. Most improved player: defensive end Chris Long. He had a combined 36 quarterback knockdowns and hurries to go along with his 8.5 sacks. Most underrated player: defensive end James Hall. Most overrated player: Take your pick of any interior offensive lineman — center Jason Brown or guards Jacob Bell or Adam Goldberg. Ram-tough award: Danny Amendola, the WR and return man. How many times did he get flattened this season, only to bounce right up? The Rams' firing of longtime equipment man Todd Hewitt is disgraceful. He did an outstanding job. He was a loyal, devoted employee for decades. Todd and his father, the late Don Hewitt, were as much the Rams' franchise fabric and history as any player or coach or executive. I like Spagnuolo a lot, but I have to say this: I worry about him. I don't want to see him become a paranoid, control-freak head coach who only wants to be surrounded by "his" guys, guys that he brought in. Spags can disregard this unsolicited advice if he chooses, but I'd really like to see him succeed and win a lot of football games here. But one thing I've learned from watching the good and the bad at Rams Park for the last 16 years is this: It's never healthy for coaches to worry about things that have nothing to do with winning or losing games. It's never healthy for coaches to be insecure about having "their" guys in place all over the building. Hewitt was loyal to the Rams because he deeply loves the franchise — which means he was loyal to Spagnuolo and to all of the men who have passed through as the head coach. I would also submit that there are far greater concerns at Rams Park. Matters that, in fact, directly impact winning or losing. OK, fire the equipment man and terminate the Hewitt family's historical connection to the Rams. Spags has the right to do that, sure. But is he going to hold "his" guys to the same standards? What about the assistant coaches and their role in the poorly conceived running game? Or the play-calling? Or the puzzling use of personnel? What about the weak game management that led to Jackson getting only 11 carries against a soft run defense in Seattle? Was that it? Did Jackson only get the ball 11 times because Hewitt gave him ill-fitting cleats that made it impossible to avoid tackles? I don't think so. Rams fans can vote for Bradford as league rookie of the year online at NFL.com. Good to see that St. Louisan Dan Connolly will return to his starting guard job for the New England Patriots for their playoff opener next weekend; Connolly suffered a mild concussion late in the regular season. He's played well and gained acclaim on NBC's Sunday night football with the now famous 71-yard kickoff return that launched the Patriots' comeback win over Green Bay in Week 15. Do you want to talk about the seven wins, and the progress that the Rams made in 2010, and how vital it was to establish QB Sam Bradford as a franchise piece? Do you want to talk about how we'll look back on the last few months and realize that this really was a good season for a franchise that went 1-15 in 2009? I agree with all of those points. And that would be a good and proper conversation to have. And I am certain we will have that discussion in the coming days. There will be plenty of time for the appreciation that comes with a long-view perspective. But that's a separate topic. A separate issue. My focus, for now, is specifically on the Rams' 10-point loss at Seattle. I'm talking about this game. We can talk about the other stuff later. But the 16th and final game -- and a failure to take advantage of such a clear opportunity -- warrants plenty of discussion in the immediate aftermath. It isn't that the Rams lost by 10 points at Seattle on Sunday night. It's the way it all went down. I think most reasonable people could accept this with more patience and understanding if the Rams had played well and coached well, only to fall short. But they weren't even close to that. They were embarrassingly bad. Embarrassingly outcoached. Embarrassingly overmatched by a Seattle team that had lost seven of its previous nine games by an average of 22 points. It's one thing to lose to Atlanta or New Orleans. But to go to Seattle and pull a no-show? It shouldn't have happened this way. Especially to the offense. And to the coaching staff. The Rams defense wasn't spectacular. But if you hold the home team to 16 points, three points under Seattle's season scoring average, then you've given the offense a good chance to come out of Qwest Field with a win and the NFC West title. Granted, Seattle's first series against the Rams was a nightmare, with the Rams blowing assignments and unable to cover Seattle's receivers down the field. But the defense recovered to control the game for long stretches. The Rams pass defense should have been tighter early in the game, and the run defense should have been tougher late in the game. Giving up 141 yards rushing is too much. But again, I don't believe the defense was the reason why the Rams came up empty. There was something disturbing about the Rams' attitude and approach. From the beginning, Seattle attacked. The Seahawks came out on the first drive, with the heretofore underwhelming backup Charlie Whitehurst in charge of their fate. And instead of backing away, and playing scared, the home team immediately went after the Rams' necks. On the game's second play, Whitehurst arched one 61 yards down the right sideline to former Rams WR Ruvell Martin to set up an easy TD. With that quick thunderbolt, the Seahawks sent an immediate message: WE ARE PLAYING THIS GAME TO WIN IT, DAMMIT. And that set the tone for the evening. That attitude gave Whitehurst confidence. Heck, it gave the entire team confidence. On the other side, the Rams were soft. And confused. And perhaps disoriented. They were a team straight from a Talking Heads' lyric: "You may ask yourself, well, how did I get here?" As for the offense, there's one question: what was the plan? Did the coaches plan to attack Seattle's horrible run defense with Steven Jackson? No, that wasn't it. Jackson's magnitude was reduced by his own coaching staff. He had 7 carries in the first half, 4 in the second half, and 11 overall. And this was a close game up until the end. The Rams were within one score, up until Seattle's late FG that made it 16-6. The game -- and the Seahawks -- invited Jackson to run it, to try and take over. Instead, Jackson became some sort of cameo-appearance player. OK, so we know the plan wasn't to batter the Seahawks with lots of Steven Jackson. So what was it then? Go after a shaky Seattle secondary with intermediate and long passes? No, that wasn't it, either. Until late in the game, the Rams were content to peck away with 3-yard, 4-yard passes. There was no imagination, no boldness, no form. The Rams were a squeeze tube of paste on offense. So again: what was the plan? What was the identity that Steve Spagnuolo and offensive coordinator Pat Shurmur sought to stamp on their team in this crucial game? What did they Rams want to stand for? Like you, I watched this game for more than 3 hours and never once had an idea of what the Rams really wanted to do, or who they wanted to be, on offense. If you aren't committed to running the ball with Jackson against a rushing defense that was ranked tied for last in the NFL over the previous nine weeks, then at least come up with something better. Try to push the ball down the field. Try to come up with some innovative plays. Try to catch the Seahawks off guard. Get "Big Mike" involved. (And where was he, anyway? 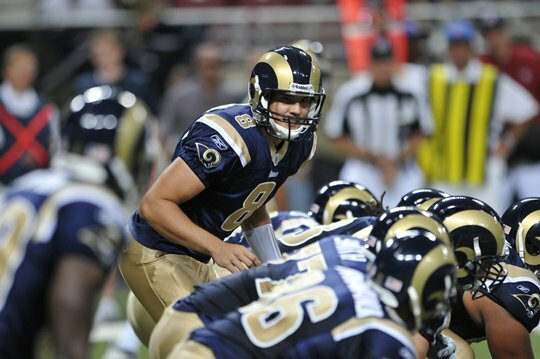 Why did the Rams activate him?) Do something that makes some sense: hit the Seahawks with "seam" passes down the middle, which they've struggled to cover. But if you've decided -- for whatever reason -- not to make Jackson's running a major plank of your game plan, then you'd better have a good Plan B. The Rams had no Plan B, not from what I could tell. They had no plan at all. This was one of the strangest things I've seen in covering NFL football for nearly 30 years. And since we're on the topic ... attacking with Jackson wouldn't have meant that the Rams were playing it safe, or going too conservative. Not at all. Here's the difference: you are guilty of playing it safe and being overly conservative when your passing game is lighting it up, and you pull the plug on it for no logical reason. Playing it safe and conservative is when you force the run and taking the ball out of your quarterback's hot hands when he's really moving the team through the air. It's when you force the run when the run is not working in a game that's been taken over by your QB. And that wasn't the case in Seattle. The Rams' passing game was dull. Rookie QB Sam Bradford didn't have anything close to his best stuff. It just wasn't happening for him. And on a few occasions when the Rams had a chance to make plays downfield, the receivers couldn't catch the ball. And that's why Jackson had to be a central figure in this NFC West title game. You see, coming out in a hostile stadium and (metaphorically) punching a team in the mouth by loading up and grinding away with a 235-pound running back is one of the strongest, powerful and confident statements a team can make. In that context it isn't conservative; it's an undeniable mission statement. It's a show of force. But SJ39 had 11 carries against a team that had yielded nearly 5 yards per carry over the previous nine games. Why did the Rams' coaches shy away from rushing the football on a night when the running lanes were open? Why did they not make full use of Jackson on a night when Bradford and the receivers were malfunctioning? Pete Carroll and Seattle didn't make that mistake. Heck, the Seahawks' running game has been weak all season -- only 3.4 yards per rush -- and they never abandoned the run against the Rams. Even after the Rams plugged the run in the 1st half -- Seattle averaged only 1.8 yards per carry -- the 'Hawks stayed with it. Jackson has started 88 games for the Rams. Only six times has he carried the ball fewer times than he did Sunday in Seattle. And he's their only Pro Bowl selection in 2010. It doesn't add up. If you're going to take the hit and fail on the big stage, shouldn't you at least try to resist by making extensive use of your most decorated offensive player and team leader? I'm not saying that the Rams should have run Jackson 35 times, regardless of game situation. If Seattle is stopping Jackson and taking him away, then you have to try something else. You can't be stubborn. But Seattle didn't stop Jackson. He had ample running room when the Rams explored Seattle's defense with him. Look, when plays are being set up for pedestrian fullback Mike Karney in key situations, then you know that something had gone wrong, terribly wrong, with the Rams' coaching acumen. How do you manage only 184 yards and 10 first downs against a Seattle defense that was ranked 29th in scoring defense and 31st in yards allowed from scrimmage? Look, we know this isn't a glamorous, jazzy, high-octane St. Louis offense. We know the Rams lack big-time playmakers. But really, now: 184 yards against Seattle? Those 184 yards were the fourth-lowest total by a visiting team at Qwest Field since the place opened in 2003. I'm thinking Rams owner Stan Kroenke will have some serious questions to pose to Spags when they get together to review the season. And the 16th game. Spags had at least two chances to challenge some calls made by an officiating crew that was just as bad as any team in the gadawful NFC West team. Spags didn't challenge. It's almost as if Spags and a lot of his players froze in this game. And I don't know why. It wasn't all just the coaching. The wideouts dropped passes. The Rams' interior line allowed penetration in the pass rush, and Bradford had multiple passes batted down. The outside linebackers got run over. And Bradford didn't play well. He was outplayed by C. Whitehurst. Sheesh. But Whitehurst had a lot more help from his coaches and receivers in this one. (And it's not as if Seattle has some formidable group of receivers. Not at all.) And by the way: let's not have any more talk about the Rams being OK at wide receiver, and not needing to make an aggressive offseason move or two to upgrade the position. This debacle was an urgent plea for assistance. Unless, of course, you want to waste Bradford's peak years. The Rams -- painfully -- were not ready for prime time. They were not ready for their close-up. Not ready for this moment. Again: I realize that this is a building year, and that most people picked the Rams to win 3, 4 or 5 games. The Rams weren't supposed to be playing for a division title. I realize Peyton Manning won three games as a rookie QB so we shouldn't be too hard on young Sam. Got it. Know it. Said it myself. It's been established. The future is promising. There was a lot to like in 2010. That's all understood. But sorry, this isn't the St. Louis Junior Football League. And the Rams didn't play Sunday's game at Pittsburgh, or Atlanta, or New England. Seattle had lost seven of its last nine and was ripe for a beating. And you don't know when the Rams will get a chance like this again; the schedule will be more difficult in 2011. And I also think the Rams deserve to be treated like a team that has gotten better, a team that is capable of playing better, a team that has earned all of these kudos and gestures of respect in recent weeks. They deserve to be viewed as something more than a charity-case, sad-sack, sorry outfit. So I wouldn't insult them by giving them a free pass for what happened in Seattle. These coaches and players have higher standards than that. And after the advances the Rams made in 2010, there's really no excuse for coming into a 16th game with everything on the line and striking out as feebly as the Rams did in Seattle.